Your honeymoon is the perfect occasion to explore this magical island of paradise – the pearl of the Indian Ocean. A honeymoon in Sri Lanka will not only give you a chance to spend quality time with your life partner but will also include unmatchable views from your bedroom window as well as interesting activities to spice up your holiday. Sri Lanka has a wide variety of attractive landscapes that honeymooners can indulge in: exotic beaches, serene greenery, cascading waterfalls, unique wildlife, and an abundance of history and culture. Now let us answer that above question in detail and begin this guide with some of the most romantic locations that make up a honeymoon in Sri Lanka. Mirissa is on the southern coast; a peaceful location with a crescent shaped secluded beach, producing an intimate setting – ideal for newlyweds. 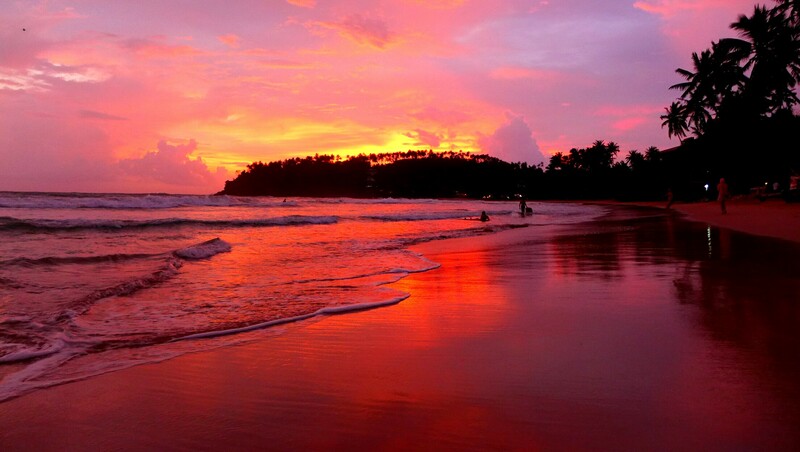 A tempting pass time on the soft sand beaches of Mirissa is to sip a coconut and gaze into the waters from sunrise to sunset as this amazing beach provides the much needed privacy for a romantic escape for honeymooners. While in the southern coast, indulge in some thrilling water sports activities such as canoeing, diving, snorkeling, sailing, jet skiing and much more in the neighboring towns of Unawatuna, Galle and Bentota. Distance from Colombo: 86kms, 1hour and 42 minutes drive. Distance from Airport (BIA): 110kms, 1 hour and 50 minutes drive. 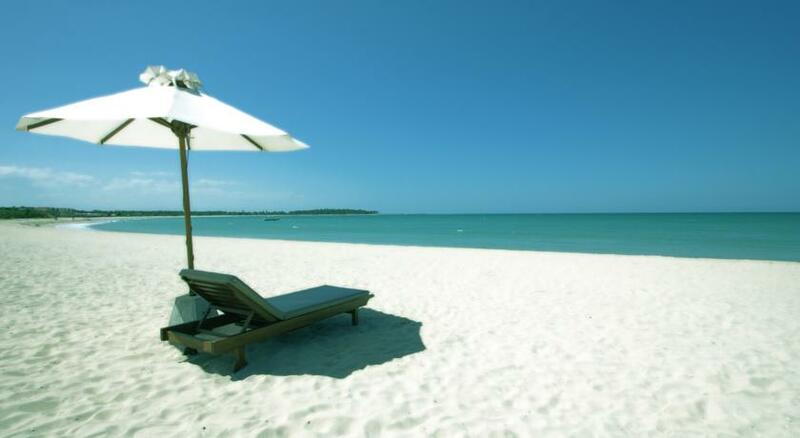 The recently discovered eastern coast of Passikudah offers calm waters in which couples can enjoy a safe swim. The village itself is a small one which has become renowned island wide over the last few years due to its virgin beach: golden bay, clear and shallow waters. Honeymooners can pamper themselves with world-class service here at one of the many top notch holiday resorts such as Amaya Beach, Sunrise by Jetwing, Maalu Maalu, Anantaya Passikudah and many more. Water sports are also common here while a perfectly romantic morning would be to watch the sunrise on this beautiful eastern coast, which is a view offered by many hotel rooms along the coast. If surfing is your kind of honeymoon activity, drive south, while still on the eastern coast, to Arugam Bay, for the best beach for surfing. Distance from Colombo: 296kms, 6 and a half hours drive. Distance from Airport (BIA): 264kms, 6 hours drive. The lovely city of Nuwara Eliya, also known as “Little England” is a popular stop for a honeymoon in Sri Lanka. The newlyweds can get a feel of the colonial culture with a breathtaking backdrop of green mountains and valleys, cascading waterfalls and red brick houses. 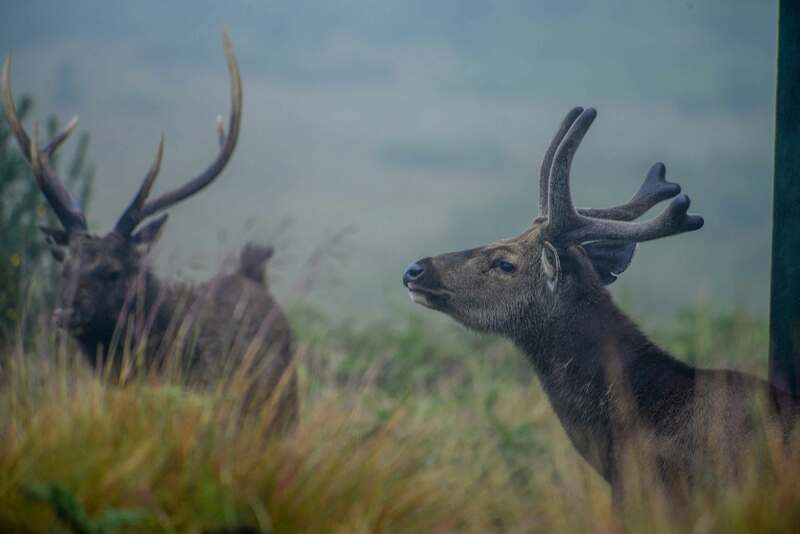 Also in Nuwara Eliya, couples can enjoy romantic nature walks on the Horton Plains during a visit to the World’s End and can also plan a trip to one of the many neighboring waterfalls where they can enjoy a chilled bath together! Distance from Colombo: 166 kms, 5 hours drive. Distance from Airport (BIA): 155kms, 4 and a half hours drive. If you and your loved one are fond of nature and wildlife, Yala is the best place to begin your honeymoon. Yala National Park has a high density of leopards along with other jungle animals. Come to think of it, honeymooning amidst a wildlife population is quite an off-beat way to spend your honeymoon and you can go back home and narrate experiences that not many of your friends or relatives must have had on their honeymoon! While reading this, you are probably wondering: “where am I going to stay in this wildlife bound area?” Several luxury camping sites such as Leopard Trails and Mahoora Safari Camps are available for honeymooners who want a blend of comfort, luxury and exciting adventures all in one stay. While on one side is the jungle life in Yala, the other side offers splendid beaches of the southern coast that you can also indulge in. So there you have Yala – one town – offering two completely different experiences of Mother Nature! Distance from Colombo: 285kms, 5 hours hours drive. Distance from Airport (BIA): 302kms, 5 hours 15 minutes drive. Spending quality time in your partners arms with jaw-dropping views like those in Ella, amidst a cozy climate; provide a great start for your married life. Ella is a gorgeous looking mountainous village in Sri Lanka that has been recently discovered as a honeymoon destination. Oh and you HAVE TO DO THIS… I’m sure you’ll agree. Enjoy a romantic train ride to Ella from Kandy or Colombo. The journey offers tremendous views of the gorgeous hill country of Sri Lanka. Luscious tea plantations, jungle canopies and cloud covers present an ideal setting to nestle yourselves cozily. 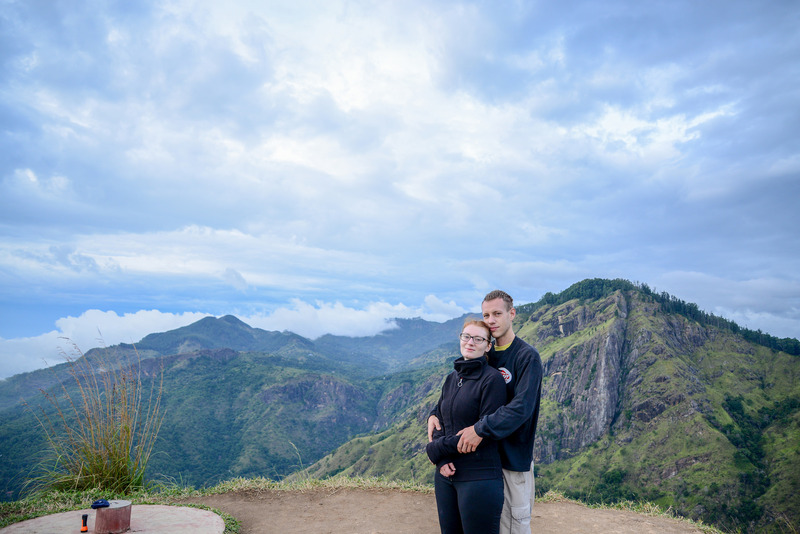 The highlight in Ella is to walk hand in hand to the Ella Gap at the crack of dawn where you will see stunning views of the Ella Rock and on a clear day, you can see all the way to the southern coast of Sri Lanka! Distance from Colombo: 208kms, 5 hours 40 minutes drive. Distance from Airport (BIA): 210kms, 5 hours 50 minutes drive. Presenting a memorable few days of alone time with your partner, Amanwella beach resort in Tangalle is one of the best. 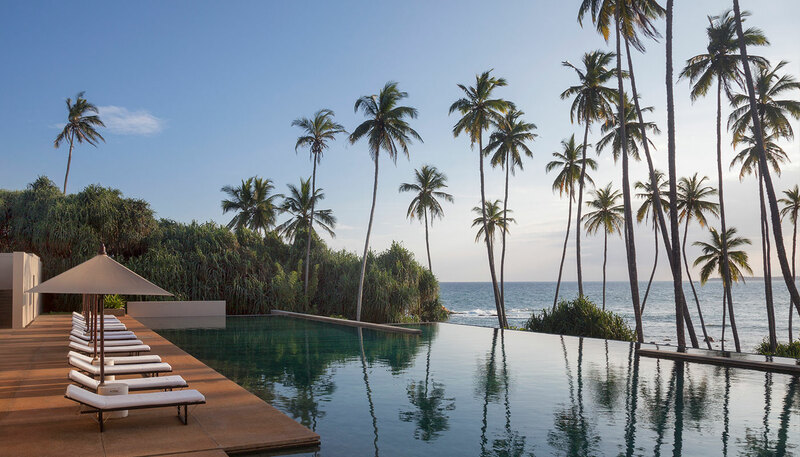 Exhibiting the blue waters of the Indian ocean at the southern coast of Sri Lanka, this hotel comes with 30 contemporary suites, each having a private plunge pool and terrace, offering guests luxury service at its best. While enjoying your stay at this resort, you can also partake in a rare opportunity to watch turtles on nearby beaches during a private walk along the coast with your spouse. If you are an elephant lover, don’t forget to visit the neighboring national parks where lots of elephant herds can be seen. This is another stunning beach property ideal for a honeymoon in Sri Lanka because it is located on the secluded beachfront of Bentota on the south western coast of the island. Why Saman Villas in Bentota? Saman Villas guarantees an undisturbed romantic holiday where you can dine under the stars on the beach or at the bar overlooking a breathtaking view of the coast, while you spend your days idling together in the pool beside a beautiful water garden. The property is perched on a rocky outcrop, offering luxury villas with tremendous views. While enjoying the modern luxuries, couples should also try out eco friendly hotels such as Gal Oya Lodge during their honeymoon in Sri Lanka. Located in the middle of luscious and green forests of Gal Oya National Park, Gal Oya Lodge blends well into its surroundings and offers sensitively designed luxury accommodation for couples. How is this place environmentally friendly? Eco friendly hotels such as these practice environmentally responsible tourism and in doing so, Gal Oya Lodge has built its bungalow accommodation from locally sourced natural materials and with minimum impact on land. Each spacious bungalow has a private living room, bedroom, and an airy bathroom with double sinks and outdoor showers. Anantaya Pasikuda is an exclusively intimate beach hideaway for couples just beginning their lives together. 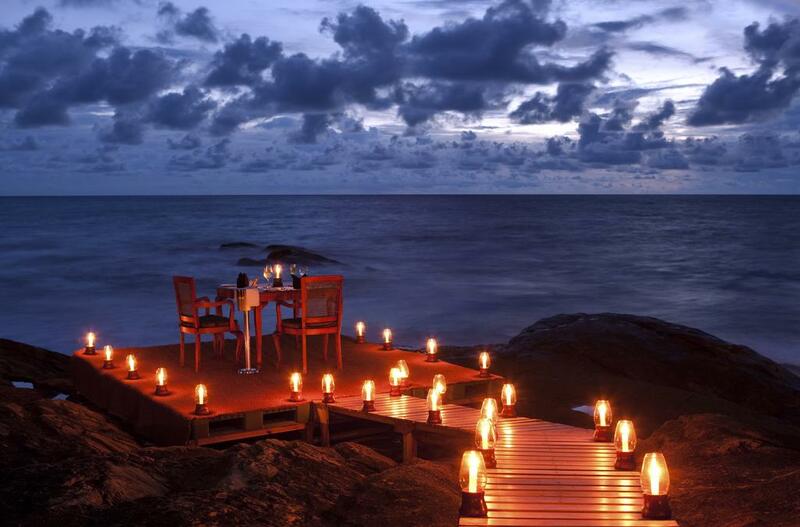 The calm ocean speaks of love while the star filled skies are an opportunity for romantic open air dinners. Catch the unforgettable experience of sunrise on the eastern coast while relaxing on the private beach of Anantaya Resort and Spa. The rooms are designed with focus on providing each guest their own intimacy. Depending on your budget, you can choose to stay in an ultra luxurious villa with plunge pools, suite rooms or deluxe rooms, all offering the best amenities and staff who will pamper you more than your parents have! Your holiday in Sri Lanka is not complete without visiting one of the designs of the iconic Architect Geoffrey Bawa. An elegant and romantic beach resort in the southern city of Galle, Jetwing Lighthouse is the place to be to enjoy an evening sunset with a drink in your hand and your partner by your side. A highlight at this hotel is the level of service and hospitality: each room is assigned to a private butler, offering honeymoon couples privacy to the max. Excellent cuisines are served at the restaurants, spa facilities are also a must-try here and of course, there is sightseeing to explore the historical city of Galle. Amidst Sri Lanka’s spectacular hill country scenery lies the estate of Ceylon Tea Trails in the beautiful town of Hatton. The property boasts 4 luxurious tea plantation houses, unmatchable hospitality and delicious food, each of which is linked with walking and cycling trails. The rooms are made cozy with wood fires, waffle linens, flip flops and organic bath accessories such as green tea soap. If you want to do more than just “being alone” with your partner at Ceylon Tea Trails, the hotel has a library of books and DVD’ s, beautiful gardens, a tennis court, bikes available for a ride, picnic baskets arranged on order, nature trails with an in-house naturalist and much more! There is a lot of hype about this honeymoon resort in the small, yet gorgeous village of Ella. The hype is well deserved though because it is the only luxury hotel in Ella and has lived up to the standards of reviewing agencies such as TripAdvisor, Bookings.com and Agoda. The resort consists of several well designed chalets that have a lovely view of the plantation and mountainous landscape. The chalets are widely spaced out; giving honeymoon couples the quietness, relaxation and privacy they deserve. Situated in the heart of Sigiriya, Jetwing Vil Uyana is another eco luxury honeymoon resort in Sri Lanka. As a peaceful and secluded property, it is surrounded by an abundance of greenery such as reed beds and paddy fields, and a beautiful manmade lake. What kind of atmosphere will you see here? A private nature reserve has been created with this hotel where in which you and your spouse will stay in a private chalet that looks like a villa which you have all to yourself. These chalets are placed in a setting of paddy fields, water, garden, forest or marsh. Each chalet is built to blend with the thriving eco system and has a private balcony overlooking a plunge pool, and a spacious bathroom. Do not be deceived by the simple exterior of the chalets as the interior will definitely live up to more than your expectations. 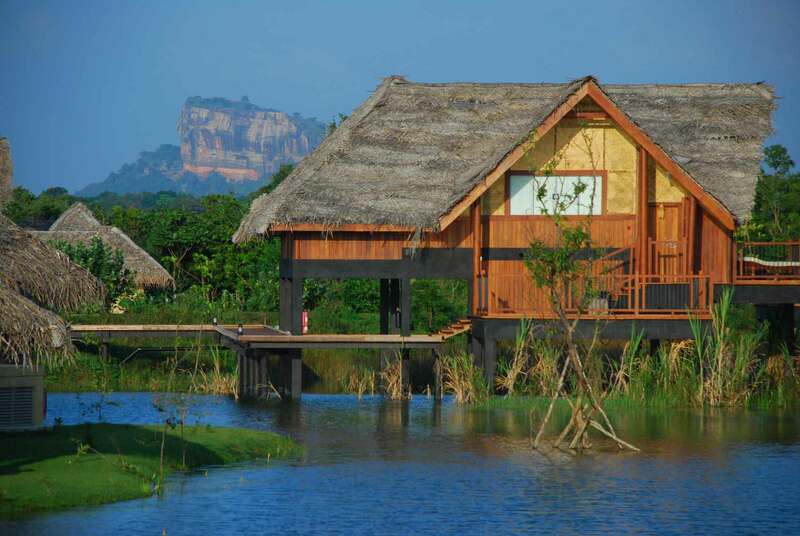 How about some rock climbing while you are enjoying your stay at Jetwing Vil Uyana – Sigiriya? If you and spouse are up for a calorie burning fun activity, all you need is a couple of hours to visit the neighboring “Lion’s Rock” and climb to the top of it to enjoy charming views of central Sri Lanka. You can also have a look at the beautiful paintings and frescoes engraved into the rock that tells a story about the ancient Kingdom during which this Rock Fortress was built. Another adventurous, yet suitable only for the fit kind of activity is to climb the Adam’s Peak in Nuwara Eliya. The climb takes about 7-8 hours (or more) both ways depending on your fitness levels. Usually tourists begin this trek in the wee hours of the night – around 2.00 a.m so that you reach the peak in time to watch the beautiful sunrise (you can literally see the sun move!) and the amazing view from up there. December to May is the peak season for this mountain climbing activity, and don’t be surprised to find groups of Pilgrims doing the climb barefoot! Tea plantations are many in the hill country areas of Sri Lanka. If you have a few nights in Nuwara Eliya, Kandy or Ella, stop by at a tea factory and learn about the manufacturing process of tea. Also don’t forget to gear up in traditional style and head on out into the plantations yourself for an exciting tea plucking experience. These are irreplaceable memories that you and your partner will cherish forever. Sometimes, when on a honeymoon, an overdose of pampering can get boring don’t you think so? Well, another adventurous activity that you can opt for on your honeymoon in Sri Lanka is that of white water rafting, on the way to the hills of Sri Lanka. Kitulgala is the popular spot for rafting where you can stop at one of the many sheds that offer rafting gear, an expert guide who will go with you and an adventurous rafting session in the white waters of Kelani River. Did you know Sri Lanka also has places where you can see whales and dolphins?! Yes, Mirissa in the southern coast (discussed above), and Kalpitiya in the western coast are popular locations for whale and dolphin watching. Simply inform your hotel or tour agency if you would like to book a boat for this activity and the necessary arrangements can be made. 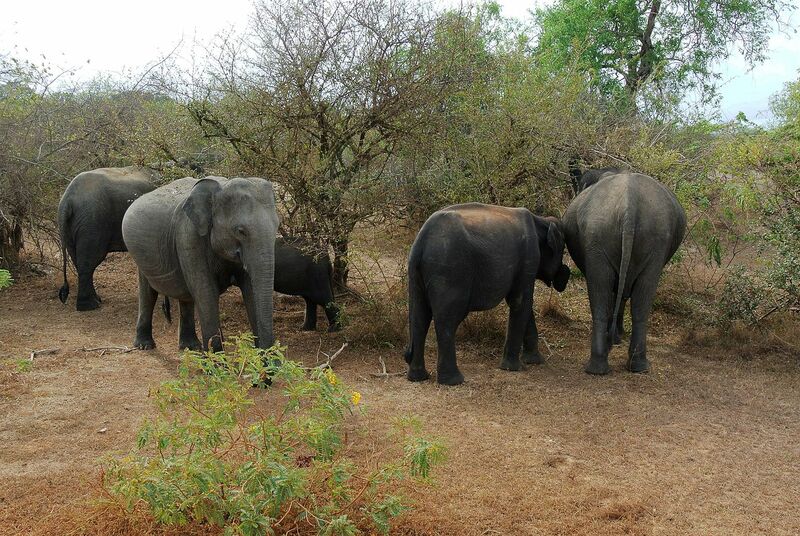 Elephants are plenty in Sri Lanka. One option is to observe them in their natural surroundings in National Parks around the country (Wilpattu, Minneriya, Udawalawa). You could also visit the Pinnawela Elephant Orphanage close to Kandy or the Millenium Elephant Foundation in Kegalle if you want to have an up-close-and-personal encounter with elephants while they are being fed or bathed. If you are one of those nature lovers and have chosen to camp a night or two in Yala, don’t forget to go for a jeep safari ride that takes you through the National Park. Bring your binoculars along so you can spot and observe the wildlife in their natural surroundings. As a newly-wed couple, you can obtain blessings from the Buddhist Monks at The Temple of the Sacred Tooth Relic – Sri Dalada Maligawa (Kandy), the most popular temple in all of Sri Lanka. Every morning, prayer activities take place here so make sure to dedicate a morning to see this very historical cultural temple, observe the traditional prayer activities and begin your life together with the blessings of the Buddhist Monks. Here’s another did you know fact for you – Yoga in Sri Lanka: Yes or No? Yes Yes Yes! Escape into a yoga or meditation retreat with your partner and enjoy some peaceful time alone, away from the hustle bustle of the real world. Detoxify your body and bring your mind at peace at one of the many yoga retreats throughout the country. Indulge in couples massage therapies amidst charming surroundings of Mother Nature and enjoy pampering at its best! What you should not miss while on a honeymoon in Sri Lanka? 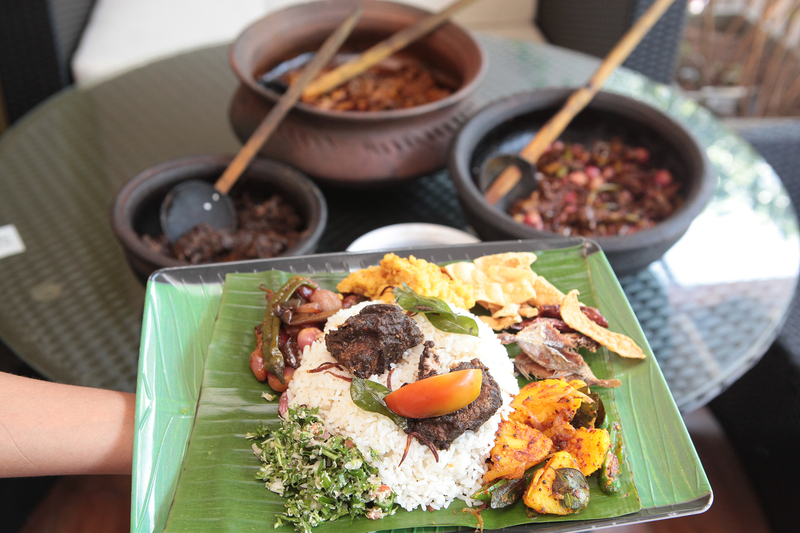 You haven’t been to Sri Lanka unless you’ve tried the local street food. Kottu Rotti, Hoppers, String Hoppers, Egg Rotti, the authentic rice and curry meal, and much more is found on street shops located on the roadside of all towns throughout the island. Apart from that, you must try local bakeries such as Perera & Sons or Family Baker for breakfast or a quick snack throughout the day. Some delicious pastries and bread items are available here. When touring the hill country or places like Dambulla and Sigiriya in central Sri Lanka, don’t forget to venture out around your hotel with your partner and visit one of the neighboring village areas. Local folk are very friendly and will be more than happy to welcome tourists and show you around their way of life. While your tour guide might take you to big craft shops in popular cities for your souvenir shopping, it is also a good idea to go freestyle-ing and explore small, low-key shops to find something out of the ordinary. Ladies, this one’s for you! 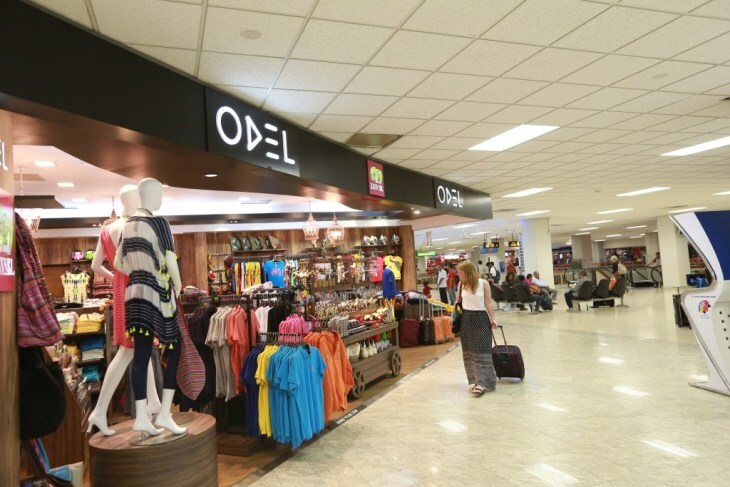 Make sure you schedule a night or two in the busy city of Colombo and visit the many local retail clothing stores such as No Limit, House of Fashion, Odel and Fashion Bug for the best deals on clothes. Also drag your spouse along to the Pettah Bazaar, which is the trading hub of the country, to lay your hands on some interesting textiles, lacing, household items, cooking spices and much much more at the best prices in town! 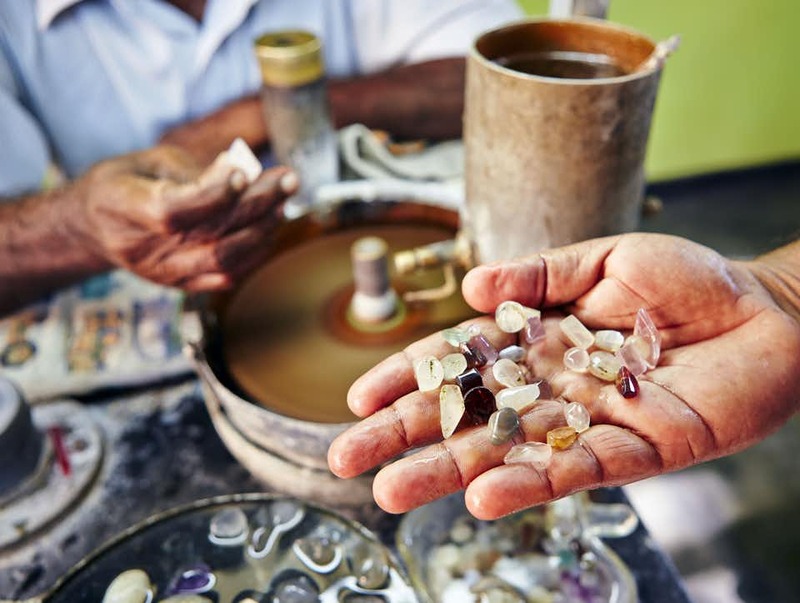 The Gem industry in Sri Lanka is over 2500 years old and has become very popular over the years. Some of the most beautiful and rarest gemstones are found in this island, most of them being seen in Galle, Ratnapura and Elahera. In terms of distribution, Colombo and Kandy have many certified gem shops for you to explore the wide variety and decide if you would like to invest in a semi-precious stone of Sri Lanka. An art that is difficult to acquire, Kandyan dancers have been exhibiting this for many many years. 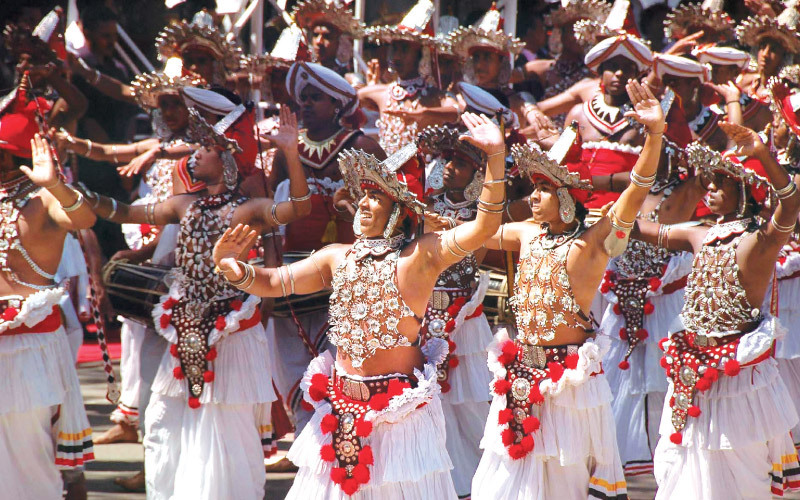 While in Kandy, don’t forget to see the cultural dance shows that often take place every evening. The attire, the dancers, the skill and the music; everything is centered on Kandyan culture. It is an interesting and entertaining show indeed. 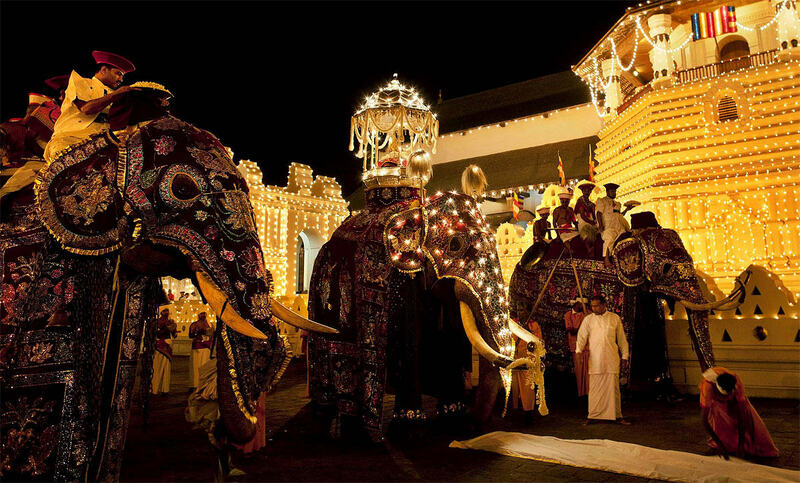 If your honeymoon in Sri Lanka is planned for July/August, you just have to stop in Kandy during the days of the Esala Perahera. This is a grand10 day Buddhist procession that takes place after the Esala full moon (Poya) holiday. A mix of culture, tradition, elegant costumes, elephants and talent such as dancers, drummers, whippers, stilt walkers, and much more is exhibited in this vibrant procession. Viewers can book seats from the official websites or simply stand on either side of the road to catch a glimpse of this stunning Perahera. So there we have it, an ultimate guide for a honeymoon in Sri Lanka… romantic destinations, best honeymoon resorts, what you didn’t know you could do in Sri Lanka, and what you should not miss while honeymoon-ing in Sri Lanka! Basically, these are all the reasons why you should choose Sri Lanka as your honeymoon destination. Don’t let the temptation remain a far-fetched dream. Make it a reality and begin planning your honeymoon in Sri Lanka now!